Auckland boat manufacturer Rayglass Boats has continued their amazing winning streak at the country’s premier boating awards: the Hutchwilco New Zealand Boat Show’s Boat of the Show Awards. At this year’s show in May, the company won the Awards for the All Purpose Family Boat Up To 8 Metres, for the Rayglass Legend 2500, and the All Purpose Family Boat Open, for the Rayglass Legend 2800. This means Rayglass Boats has now won a Boat of the Show Award (and very often more than one) each year since the Awards in their current format were introduced in 2000. Over the past 18 years, Rayglass has won an astonishing 33 Boat of the Show Awards and secured the country’s most prestigious boatbuilding award: Boat of the Show: Overall Winner (now Supreme Winner), a just-as-impressive six times. Rayglass’s on-going award-winning blitz has been led by their hugely popular Legend 2500, easily New Zealand’s best selling 7-metre GRP boat. The Rayglass Legend 2500 has won seven Boat of the Show Awards since its launch 11 years ago, making it the most awarded boat in Awards’ history. 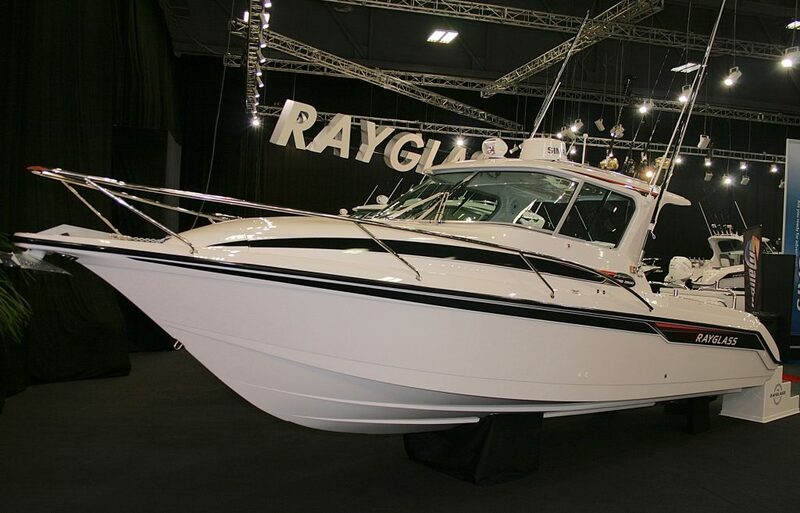 The much-admired Rayglass Legend 2800, until recently the flagship of the Rayglass Legend fleet, has been just as successful, with six Awards since its first appearance in 2007. Since 2000, Rayglass has also won four New Zealand Boat Show Stand of the Show Awards and three Innovation Awards (for their Protector Series, their combination RIB/PWC Pro-Jet and for their unique in-hull rod locker). In addition to its multi award-winning series of GRP powerboats, Rayglass also manufactures the internationally renowned Protector range of patrol, work and pleasure RIBs and the highly innovative Pro Jet (the world’s first commercially manufactured PWC powered RIB). The company has also just released their new flagship, the much-anticipated Rayglass 3500, which is set to be one of New Zealand’s most popular production launches. Based on the water’s edge in Auckland, New Zealand, Rayglass today employs over 60 people in three state of the art manufacturing facilities and is one of New Zealand’s most successful marine businesses, both at home and internationally.